Following up on last posting and in the light of Wikileaks publication of cables between American Consulates in China and the Chinese government, it has become obvious that both governments are eager to defuse the tension and find a solution to the North Korea problem. Apparently, the South Korean government has been very creative in this respect. It has started to make contacts with Chinese authorities and companies and promised them to give them wide oportunities for the exploitation of North Korea mineral resources as revealed in Wikileaks and reported by the New York Times. The Chinese and American seem both to be wondering what to do with the enfant terrible that has become the mark of Kim Jong-il and his chubby son Kim Jong-un. Wikileaks reveals that even the Chinese did not believe in the regime's nuclear capabilities and are a bit petrified by its sudden mastery of nuclear bombs. Unfortunately, there does not seem any crucial cable revealed by Wikileaks about Taiwan and China, just the usual information about arm sales to Taiwan; no wonder, Taiwan is an invisible country in world diplomacy, even Wikileaks is silent about Taiwan. We'll just have to learn what American spies were capable of in the movie Formosa Betrayed . Let's hope that if the North Korea State crumbles, and it could happen within a year, that North Korean won't suffer the fate of Chinese miners. It is a piece of good news to hear that China has sent emissaries to both North and South Korea while receiving a high placed official from North Korea. It might finally have no choice but finding a solution to the recurrent problems on its north eastern border. It is no secret that China's policy in that region is based on avoiding at all costs having a share a border with an ally of the United States. It might have to face reality even more than Kim Jung-un in waiting leader of the seemingly recluse nation. Wouldn't the obvious solution be to have America and China sign a formal international treaty whereby the US would accept not to station troops less than, for example, 100 miles from the northern border? A solemn and formal decision that could create a 100-mile-wide demilitarized zone south of the border. 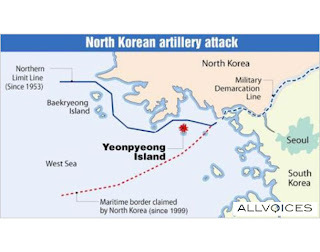 South Korean Troops would be allowed limited military posting and the Chinese could have the necessary troops to watch the now porous border. Not that it would be necessary to keep an eye on that border; it is hard indeed to imagine China invading North Korea when it has enough trouble on its western front. 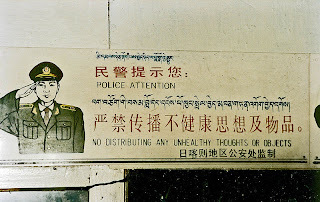 This is no wishful thinking: already an estimated 200 000 North Koreans live on the Chinese side of the border and people move back and forth bribing, among others, the North Korean border patrols. Smuggled Chinese mobile phones can be still be used 30 km inside North Korea and enable North Koreans to keep in touch with escapee relatives in South Korea. News filter in from the outside into North Korea and this, more than anything, could explain the recent bout of violence that killed two civilians in the South after the army bombed houses on the island of Yeonpyeong. 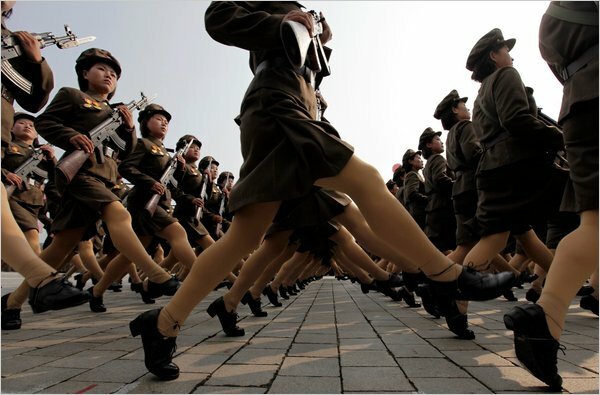 A show of force by the new North Korean leadership is only part of the reason for this unprecedented violence. Reporter Barbara Demick wrote a book based on two years of extensive research with escapees, Nothing to Envy , which describes daily life within North Korea. It destroys completely the idea that it is a totally hermetic country. It also redeems our faith in human nature when some human beings always succeed to see through a wall of lies, no matter how well conceived. China could very well face its very first test in real international diplomacy for the good of the rest of the world. This is an exam it cannot fail. China's People's Daily Online has just posted its renown "Most beautiful Chinese Female Soldier." Its site has put online 11 pictures of the beautiful soldier. The editors of the Global Times must be fuming for not having been given first choice of the news. My apologies, trying to cover both sides of the Strait and using all existing search engines, I just could not find Taiwan's most beautiful soldier. Probably is a state secret or there could be too many competitors. 蘋果個哦那是司救命中國字嗎？ Apple's iPhone to Save Chinese Characters? Today's Chinese young people are forgetting how to write Chinese characters. 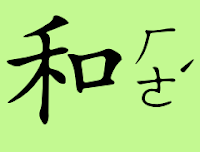 They spend more time typing Chinese characters using pinyin on phones and computers that they have lost practice writing characters. China's People's Daily on-line reports that smart phones such as Apple's iPhone are bringing back old practices of actually writing characters with a pen, or in this case, with your finger. 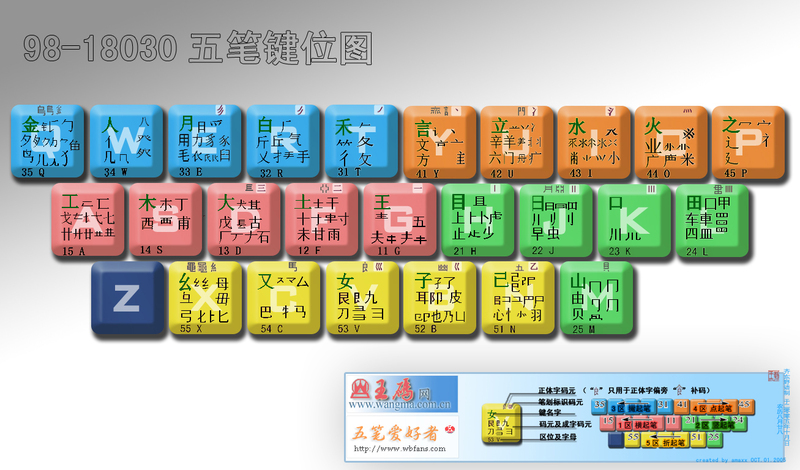 For a while in the 1990's and at the beginning of this century, many Chinese secondary schools taught the Wubi Method 五筆字型輸入法 input method. Wubi is based on the constituents parts of Chinese characters, therefore users have to remember how to write Chinese characters and their strokes or elements. However, today, many young Chinese haven't had the opportunity nor the desire to learn Wubi, an efficient method which enables its users to type 150 characters and above a minute; the learning curve is however extremely steep. This might not be an issue anymore since the introduction of smart phones such as Apple's iPhone and the iPad which lets users use their fingers to input Chinese characters. It's comforting to see China and Taiwan agree to meet at the first Cross-Straits Chinese Character Art Festival, which took place in Beijing and included experts from China and Taiwan. The problem seems to be more serious in China where the use of touch screens is not so prevalent. The question remains whether software might correct "Republic of China" and change it automatically into "Chinese Taipei." This has become irrelevant since at the conference "Chinese Taipei" had been rectified into The Taiwan Region by The China Region Authorities. The Singapore government parties, the PAP and the YPAP have found an easy way to solve problems: Stop complaining. As the Temasek Review, an opposition Web site discovered. This is true, no complaints, no problems, no disturbing news. The Temasek Review thinks it might even make terrorist disappear. This philosophy is probably at the root of why six ambassadors won't attend Liu Xiaobo 劉曉波 Nobel Peace Prize ceremony in Oslo. Russia, Kazakhstan, Cuba, Morocco, Iraq and China's ambassadors have decided not to attend. Oslo's government is not complaining, neither are the other five govenments; they probably hope that China's ambassador won't attend if one of their citizens is awarded a Nobel Prize in the future. 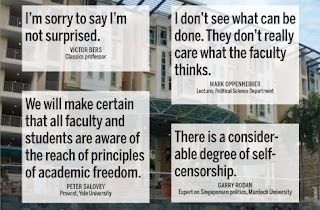 Coming back to Singapore, is Prime Minister Lee Hsien Loong's complaining? Certainly not! Not when your pay jumped to 2.4 million US dollars, nearly 6 times US President Obama's US$ 400 000. Singapore is classified as the country with the least corruption in Asia: who needs to be corrupt with such salaries. 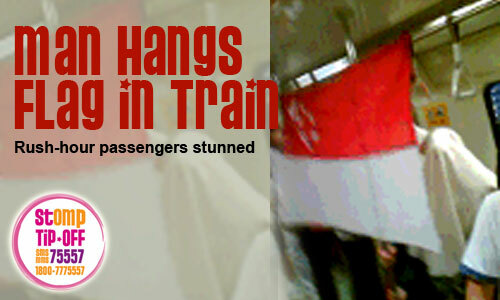 SMRT said: "In this instance, the state flag should be treated with respect." Nobody should be complaining either that one of Singapore's best movies Singapore Dreaming 美滿人生 is unavailable in Singapore. HMV's database does not even have it listed in its database. There is no problem, nobody is complaining. Its trailer was practically banned in Singapore. At least you can buy it on the web or in DVD stores in Taiwan. No matter that the opposition parties with 36% of the votes never get more than two seats in the parliament. Anyway, Singapore's government is rated by the World Bank's as high on rule of law, control of corruption and government effectiveness. Critics are just a bunch of whiners. Both French and Macao Police Forces anxious to make protesters invisible. 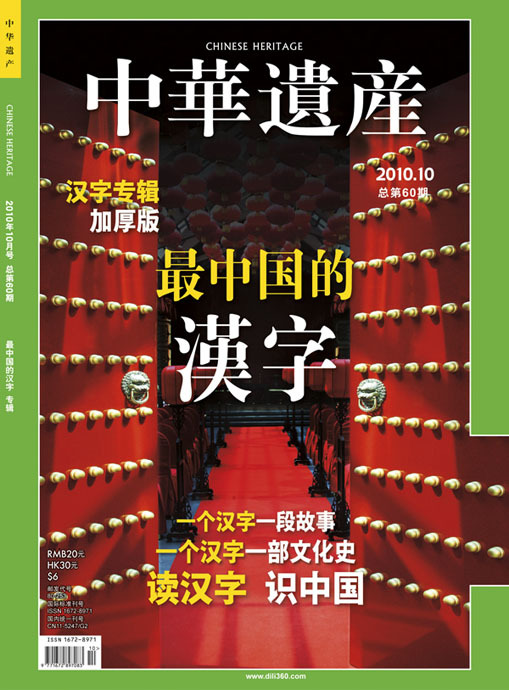 Although the Assistant to Macao's Police Commissioner, 馬耀權 Ma Lo Kun, had declared on Nov. 10 to the Macau Daily Times that the "Police welcome all persons who meet Macau's immigration regulations to come to Macau," the chairman to Hong Kong Democratic Party, Albert Ho 何俊仁 and four other activists were refused entry to the former Portuguese Colony. Macau does have a constitution which guarantees political freedoms and freedom of speech. Let's not forget also that during Hu Jintao's visit in Paris, protesters who had positioned themselves at strategic points in the capital, but at a distance from the official route, had their umbrellas forcibly removed from them by the French Police. The demonstrators were protesting against Liu Xiaobo's detention and bearing the 08 Charter's name. The demonstrators had managed to sneak near the barriers carrying white umbrellas carrying Liu Xiaobo's name. When they opened the umbrellas, the police rushed to seize the offending objects. In Macau, some protestors did manage to sneak in a couple of days before Wen Jiabao's arrival to protest. 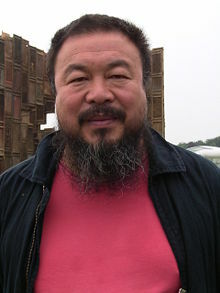 They were eventually sent back to Hong Kong after they had succeeded in protesting against Liu Xiaobo's imprisonment. It is a sign of China's rising power that it is their heads of state and government which generate the most protests abroad. Where are the Americans when we need them? Now that former President Bush has retired he might be looking for a part-time job training Chinese leaders on how to travel abroad and face demonstrators in every city. But then, Bush had ample experience at home, Americans had been demonstrating against him for years; an opportunity Chinese leaders sorely miss, I'm sure. According to the Norwegian News Agency, NTB, Aung San Suu Kyi အောင်ဆန်းစုကြည် has been invited by the Peace Nobel Prize Committee to come to Oslo to receive her prize. She was originally awarded the prize in 1991 but was banned from travelling. She has been under house arrest since 1990 when her party, the National League for Democracy won Burma's (Myanmar) general election with a vote percentage of 58% and 80% of the seats. Her recent release by the Myanmar Junta Government from house arrest has made her travelling to Norway a possibility. It is not certain that the Chinese government was notified in advance of her release. 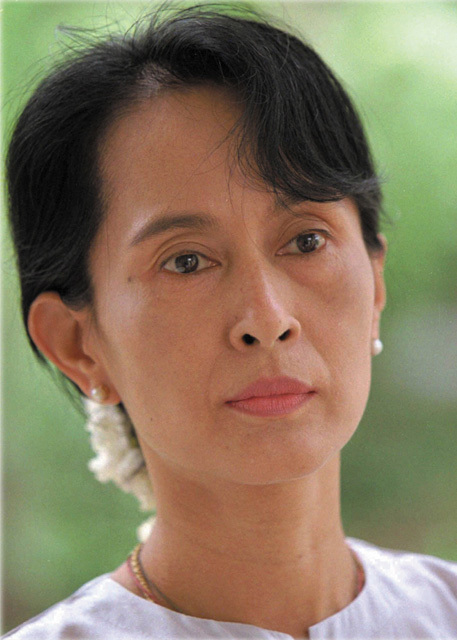 The Myanmar generals might have failed to realize that the Nobel Prize Committee, being of an independent mind, would seize the opportunity to invite and honour in person Aun San Suu Kyi. 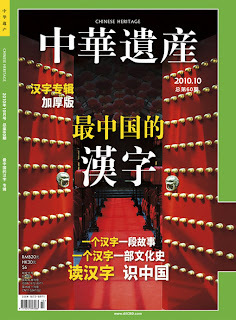 Unfortunately for Liu Xiaobo | 劉曉波, this announcement probably means that his chances for release have sunk even deeper. Some officials in China must be watching Myanmar's developments with intense trepidation. I wonder whether, as in Norway, a Chinese Minister was sent to Rangoon | Yangon 仰光 to warn Burma's generals not to release Aung San Suu Kyi. What they did not know is that the Myanmar Junta can be as stubborn as Norway's Nobel Prize Committee. 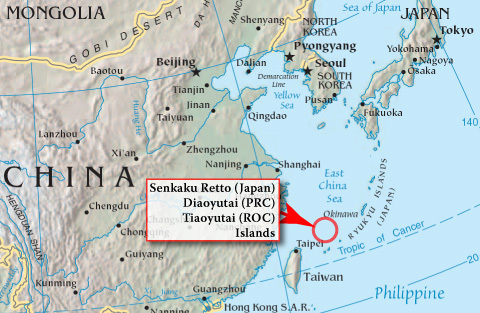 The Chinese government claims the Diaoyutai Islands are an integral part of China. 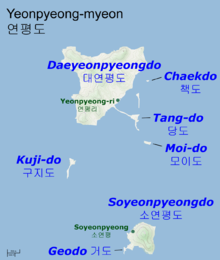 At the same time it does not allow its own Chinese nationalists to land on the main island. On the other hand, some Chinese are protesting over Japan's action against the Chinese ship. 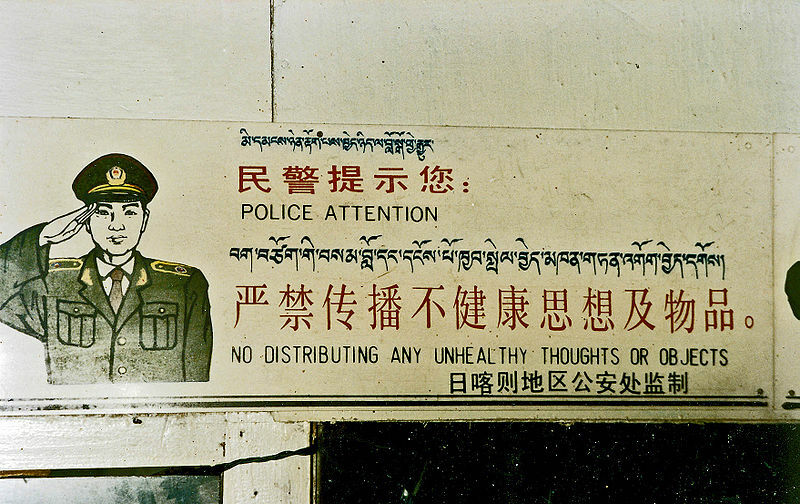 Demonstrations never take place in Chinese cities unless the police, and therefore the government, agrees with them. It is alleged that there is a secret agreement between China and Japan. In return for China's ban on overzealous militants, Japan does not arrest Chinese fishermen. 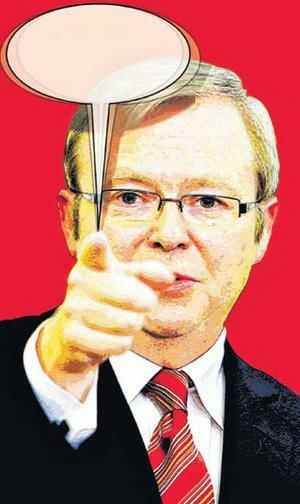 Just that, this time, new staff at Japanese Foreign Affairs were not aware of the pact. In the meantime demonstrations are taking place in Japan to support Nobel Prize winner Liu Xiaobo. Nobody has been arrested. After all Japan is a democratic country, even though it still has the death penalty on its books. 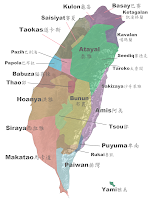 Taiwan, for once not shy, also lays claims on the island. Is President Ma Ying-Jeou going to don a yellow (blue?) 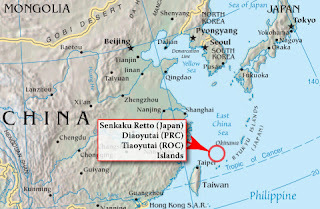 life jacket and plant Taiwan's flag on Diaoyu Island on China's behalf? Mobile phones will soon be banned on all Chinese and Japanese ships. 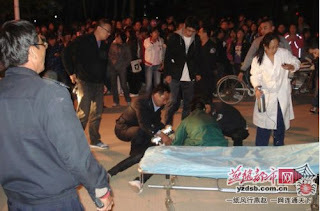 The Global Voices independent site, made up of bloggers, reports on a driver who ran over two girls on a school campus in Hebei University. One of the girls is dead. The driver, stopped at the gate by security, arrogantly defied the guards saying: "My father is Li Gang." Li Gang is the deputy director of the police department in Baoding 保定 (Hebei Province). This time the censorship guardians have been sleeping on the job and the info is freely available on Chinese web sites. Unfortunately, since killing the chicken to frighten the monkey is official policy in China, one wonders what fate awaits the rogue driver who might be sacrificed to assuage some public vigilantes. Human Rights do apply to everyone, don't they? 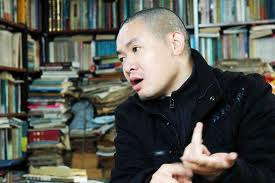 Many Chinese bloggers are letting off steam against the arrogance of many officials who always seem to be above the law until public anger vents its discontent. The Chinese could then hold demonstrations about the conditions for detainees in French prisons and the treatment of migrant workers in the EU. The 沙阿魯阿族 Hla’alua aboriginal language in Taiwan is slowly fading away as reported by 聯合新聞網 United Daily News in its "Important Home News Section" 國內要聞. 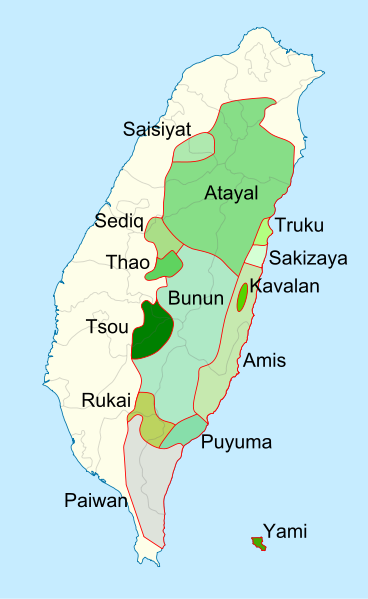 The Hla’alua tribe is located in Kaohsiung country 高雄縣 in southern Taiwan. The Hla'alua are a branch of the Tsou aboriginal group. They now barely number 500 and only 10 of them are still capable of speaking their ancestors' language fluently. Today having been swamped by modernity, they have switched to Taiwanese. The Hlua'lua tribe's situation is not unique. Before the Han Chinese came 300 years ago, encouraged by the Dutch, the Aborigines inhabited the whole island. As in many countries, the ethnic minorities were pushed back away from the main urban centres. Many years of successive assimilationist policies by the Japanese and then the Kuomintang governments have had their toll. The recent positive support first by the DPP 民進黨 and even President Ma Ying-Jeou's belated tepid support have had little effect. When I went to Hualien and talked to young people from the Truku tribe, I couldn't find a single youth who could talk the language of their tribe. This they told me with a gentle smile of resignation. I left wondering what they themselves would be transmitting to their own children. Dancing for camera-mad tourists is not something I would relish. Neither taking part in these tours where you stare at dances you don't understand is something I could never do, just not me. The Hlua'lua leaders explain that maintaining food, wedding and religious traditions is possible; but just pass on the mother tongue is not easy (唯獨母語傳承不易). They go on explaining that the children don't want to feel different at school. 84 year-old Yu asks, "you can speak the language, but with whom would you speak it?"